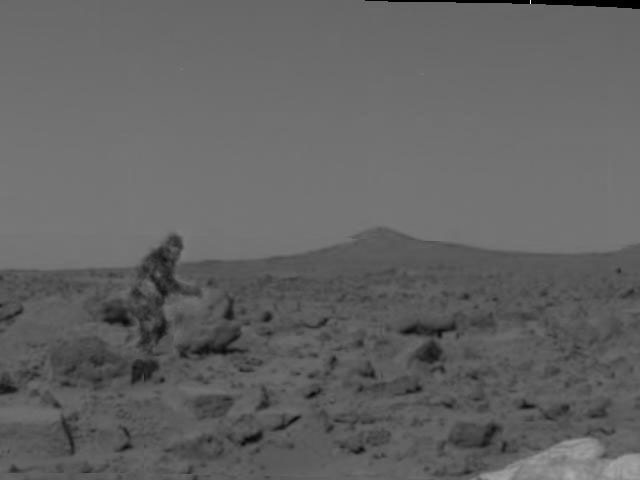 The author of this URL (http://www.rdrop.com/users/tblackb/life_on_mars/life_on_mars.htm) claims to be in possession of actual photographic proof that there is life on mars. As you can imagine, I was, and still am very skeptical. But this got me thinking about other forms of life. I’ve heard rumours of bacteria and other unicellular organisms on mars. This leads me to my question. Have scientists actually found bacteria on mars? Could life actually survive on Mars? Before I address the questions you pose, Andrew, let me comment on the website where you found that link. It seems to be the personal homepage of an academic man, with interests ranging from photography to music theory, and he writes eloquently and intelligently on these topics. Nothing at all, then, like the Life On Mars page. I’m not at all certain whether it’s a serious page, or part of an elaborate joke. I will assume the former, because debunking lunatics is more fun than explaining jokes. He talks a lot about building top secret equipment to intercept signals from the Mars rovers, about how he had to use a small dish to “avoid arousing suspicion”, and how he calibrated the trinary signal with the Cosmic Background Radiation to decode monary signals and feeding it all into a device of his own design called a Dyna-Static Tri-linear Accelerator. If it sounds like the arbitrary technobabble from a Star Trek: Generations episode, that’s because it is. He seems to have flipped through a technical dictionary and grabbed the most science-fiction sounding words, then invented a few more words on similar lines, mixed them all up and sprinkled liberally through the article. The end result of all his hard work is the picture to the right. I see two problems here. First, Bigfoot is well known as a large apelike creature shambling through the Western regions of North America. He is very very far from home in this picture, and is presumably on death’s doorstep since there doesn’t appear to be anything there for him to eat. Or breathe. Secondly, if we look at another picture, released by NASA and still available on their website, we see the exact same figure in the exact same pose… but in a different place. Coincidence? Or just photoshop? Of course, NASA’s image is a great deal clearer, and easily explained by our brain’s remarkable ability to find patterns and familiar shapes, even when they don’t exist. There is an entire industry of humorous pictures being emailed around which look like one thing (A woman’s bikini area, usually) but are actually something far more innocuous! No. They have found rocks, sand, interesting minerals and (possibly) water ice near the various rovers and probes, and we’ve known about the composition of Mar’s atmosphere, and the presence of polar ice caps composed of water-ice and Carbon Dioxide ice for over a century. There is zero evidence of actual living creatures on Mars. BUT! a meteoroid found in Antarctica in 1984 was found to have originated from Mars (possible from a massive asteroid strike, or volcanic eruption). In 1996, scientists analysing the rock found what appeared to be fossilized bacteria buried inside it. The discovery was originally written off as contamination from Earth – these germs were Earth bacteria and had grown on the rock some time in the thousands of years that must have passed since it landed. But more recently some researchers have become convinced that the bacteria were deep enough inside the rock that they could not have penetrated from the outside. In other words, they must have been on the rock before it reached earth, and therefore must have come from Mars. They have not convinced other scientists, however, so the debate continues. We’ll have to wait for another team to have a go and see if they find the same results. If true, then it means that there is, or at least WAS, life on Mars in the form of bacteria or similar micro-organisms. Absolutely. Mars is a very harsh environment, with extremely low atmospheric pressure (close enough to a vacuum as to make no difference for anybody caught without a space suit), and very low temperatures (Local extremes might get as hot as 20 degrees Celsius, but the global annual average is about -63 degrees, with a minimum of -153 degrees! That makes a Siberian winter look positively sweaty). Then there’s the atmospheric composition – mostly carbon dioxide with practically no oxygen or water. These conditions are inhospitable to most life that we’re familiar with, but in fact there are plenty different species (baceria and lichens, for example) on Earth which survive under similar conditions. Life is definitely possible, and some colonisation plans even include the possibility of seeding mars with such primitive organisms to break down minerals on the martian surface, liberating oxygen into the atmosphere and making the planet more hospitable! So where does this leave us? Mars can sustain life. It is a harsh environment, cold and dry with gaspingly thin atmosphere composed mostly of carbon dioxide, and exposed to cosmic and solar radiation. But there are organisms on Earth which handle worse every day in undersea volcanic vents, or hot sulphur springs. And it has water (even if, so far, it all seems to be frozen solid). But knowing that life could exist doesn’t mean that life is actually there. The only way to really answer that question is to actually find it. We have robotic laboratories trekking across the surface, studying and sampling, and hopefully in the future we can improve our presence there. And then, hopefully, we’ll know.